Welcome to Seminarian Mr. Mark Miley! "Evangelization of this 'digital continent'"
Monsignor Romero's Trip to Washington D.C.
…to take on the responsibility for the evangelization of this "digital continent". Be sure to announce the Gospel to your contemporaries with enthusiasm. You know their fears and their hopes, their aspirations and their disappointments: the greatest gift you can give to them is to share with them the "Good News" of a God who became man, who suffered, died and rose again to save all people. Human hearts are yearning for a world where love endures, where gifts are shared, where unity is built, where freedom finds meaning in truth, and where identity is found in respectful communion. Our faith can respond to these expectations: may you become its heralds! The Pope accompanies you with his prayers and his blessing. There, you can find a new Calendar with events happening around the church parish. There is a new feedback page for folks to email the church parish. We’ve also got the Photosynth/3D photo of the Father Lafleur monument along with downloadable prayer cards in remembrance of him. The website is usually updated weekly on Thursdays with a downloadable/printable copy of the bulletin. A Blog is a website where updates, news, and current events are written about. 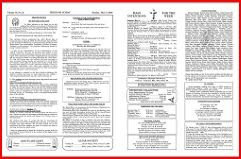 It gives the parish a place to provide additional and more current information than can be fit into the bulletin. It is updated daily and sometimes as much as 6 times a day! And now we have a Twitter site. Twitter is a lot like a blog but the messages there are very tiny in size. Twitter can send text messages to parishioners as events are happening around the parish and diocese. Our Twitter name is StLandryCath. I take this opportunity to thank Mr. Guidroz for a great work. He is putting St. Landry Church in the forefront of the digital world. Mr. Mark Miley is a seminarian for the Diocese of Lafayette, Louisiana and will be with us for the summer. Seminarian Miley has completed two years of pre-theology studies, and will begin theological studies this fall at Sacred Heart School of Theology in Hales Corners, Wisconsin. Sacred Heart of Jesus on the Teche, New Iberia, La. is Mr. Miley’s home parish, which is also where he was for last year’s summer assignment. Mr. Miley is 50 years of age; a widower and has two children. Catherine, age 25, lives in Dallas, Texas with her husband and newborn daughter. Mr. Miley considers himself truly blessed with his first granddaughter. His son, Alex, is 22 years old and attends Northwestern State University in Natchitoches, Louisiana. 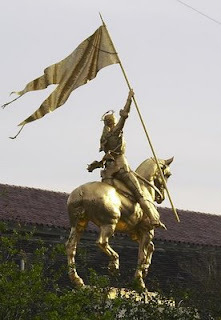 Today is the Feast of St. Joan of Arc, the Maid of Orleans. She is the patroness of France and soldiers. Born in 1412, she received personal and general messages from the saints starting around the age of 13. St. Joan received revelations that told her to go forward as a general to help the King of France regain his kingdom from the English. At the age of 17, after meeting with the King, she set forth with a small group of soldiers and there began a series of great military victories that culminated with the crowning of the king at Rheims. Political intrigue caused her to be captured and tried as a heretic. She was burned at the stake at age 19. Within 20 years, her case was reopened and she was declared not guilty posthumously. The cause for her sainthood peaked with her canonization by Pope Benedict XV in 1920. Her feast day is today, May 30, the date of her death. More information on her life can be found in the Catholic Encyclopedia by clicking here. 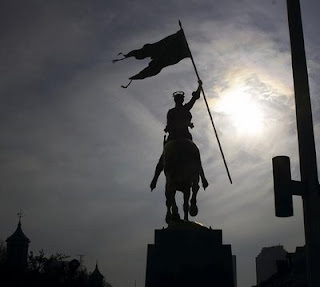 The statue featured in the photos of this post is found in New Orleans at the corner of St. Philip and Decatur, along the Mississippi, near the French Market. It was a gift from the people of France and is a duplicate of the famous statue at Place des Pyramids in Paris. The statue was sent to New Orleans in 1958 and stored due to lack of funding. After French President DeGaulle's visit in 1960, a group was formed to fund a project to erect it. 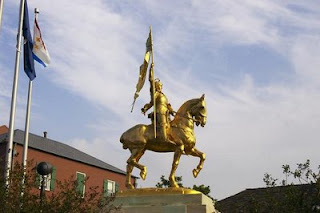 It was placed on a 17 foot pedestal at the end of Canal Street in 1972 and was gilded in 1985. It was later moved to its current place. 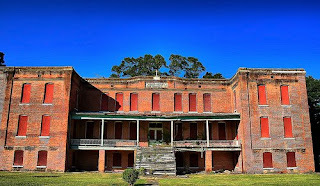 Holy Rosary Institute was opened back in 1914 as a school, dormitory, and convent. Some of the initial financial investment came from St. Katherine Drexel, the Philadelphia born daughter of a philanthropist who became a nun and donated much of her $20 million inheritance to the education of blacks and Native Americans. The grounds have fallen into disrepair and many of the alumni have worked together to form a group to try to save the buildings while turning them into a spiritual and educational center again. Their site can be found by clicking here. Lafayette City-Parish government is working toward a comprehensive plan of upgrading sites with a view towards what Lafayette will be in the next century. The restoration of Holy Rosary Institute is one site that is being considered. To read a recent news article on this, click here. 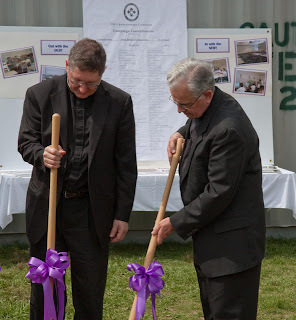 The Community of Jesus Crucified, with Father Michael Champagne and Father Jerome Frey, is based there on the grounds. The Spirit of truth will guide people to all truth. As the Father sent me, so I send you. Receive the Holy Spirit! Our fifty-day celebration of Easter culminates on this day when we remember with vigor the inrushing of the Holy Spirit upon the disciples. As we listen to the words of scripture today, let us open our hearts to a renewal within ourselves and within the entire Church. Let us pray that the Spirit will take hold in us and strengthen us on our mission to bring food to the hungry, shelter the homeless, and justice to those who are oppressed. Veni Sancte Spiritus! Come, Holy Spirit! When have you heard your inner voice or conscience guiding you to do what is right? When have you felt the Holy Spirit in your life? When have you felt the power of the Spirit, giving you the right words, giving you insight into a dilemma, or in other ways? The bulletin for the weekend of May 31, 2009 has been posted. Click here to see it. L'Angelus, a local family band of Catholics that play beautiful music with a Cajun influence, will be performing on EWTN tonight live. The show "Life on the Rock" will be broadcast at 7 PM CST. EWTN is found locally on Channel 35 if you have Charter Cable in Opelousas. The three older siblings do a lot of the performing but, many times, all 9 of the family members perform. Those of you who participated in the Walk for Life in Opelousas this year will remember them playing both before and after the event. Click here for the band's website. Click here for EWTN's Life on the Rock's website. Let us think again of St. Paul’s phrase: both Apollos and I are servants of Jesus, each one in his own way because it is God who gives the growth [cf. 1 Cor 3:5-9]. These words also apply to us today, to the Pope, the Cardinals, Bishops, priest and laity. We are all humble ministers of Jesus. We serve the Gospel as best we can, in accordance with our talents, and we pray God to make his Gospel, his Church, increase in our day. At 10 AM Mass on Sunday, we took time to recognize and remember our veterans who have served, have given the ultimate sacrifice, and those who are still serving. Click here for photos from the mass and remembrance ceremony. 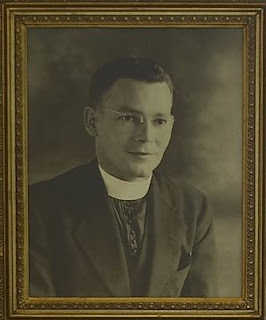 Below, is a novena to Lt. Father Verbis Lafleur, a St. Landry Catholic Church parishioner, priest, and soldier who gave his life in World War II. 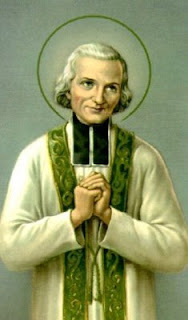 O, God of Goodness,You never tire of sending us examples of Your Love.You called Your servant Father Verbis Lafleur to the Priesthood from an early age and kept him in Your sight.In the fulfillment of time, he willingly offered up his life for his God and his country. Far from home on the battle fields of the South Pacific, O Lord, You were with him.You were with him in the prison camps.You were there, as he healed the spiritual wounds and comforted his comrades. May we all be blessed by his holy and heroic life, as he was doing Your will. Our loving God, lead us to charity and allow us to receive the favors we ask through Your good servant Father Verbis Lafleur (name your petition here). We ask this through Our Lord, Jesus Christ, Your Son, who lives and reigns with You forever and ever. Most Reverend Michael Jarrell, D.D. The meaning of this last gesture of Jesus is twofold. Above all, ascending on “high,” he unequivocally reveals his divinity: He returns to where he came from, that is, to God, after having fulfilled his mission on earth. Moreover, Christ ascends to heaven with the humanity he had assumed and which has resurrected from the dead: That humanity is ours, transfigured, divinized, made eternal. The Ascension, therefore, reveals the “supreme vocation” (Gaudium et Spes, no. 22) of every human person – called to the eternal life of the kingdom of God, kingdom of love, light and peace. Those of you praying the Novena in Honor of the Holy Spirit are now praying Day 3 and counting down the days until Pentecost. Click here for our earlier blog posting that gives details about praying that novena. This past Lent, Father Mark Thibodeaux, S.J. conducted a Parish Mission on the topics of “Cloister, Community, and Hospitality.” As a way for us to keep the mission’s message alive in our hearts, the handout for each session will be posted here on the blog. Today, “Session III: Hospitality” follows. Parishioners are encouraged to leisurely reflect on these handouts. Let the content inspire us to grow in the Lord Jesus. Jesus replied, "A man was going down from Jerusalem to Jericho, and he fell among robbers, who stripped him and beat him, and departed, leaving him half dead. Now by chance a priest was going down that road; and when he saw him he passed by on the other side. So likewise a Levite, when he came to the place and saw him, passed by on the other side. Looking back on times that I have "helped" someone, do I recognize that I might have been responding to my own needs rather than to what the person actually wanted/needed? Speak with Jesus about this. Can I recall a time when someone really listened to me as I told my story. How did that feel? Can i recall a time when I was that Keeper of the Stories for someone else What was that like? Speak with Jesus about this. Do I answer and welcome Jesus into my home no matter what face he is wearing? Is there some person or type of person that is not welcome in my life? Is God calling me to open the door to this person at this time? God's sign is that he makes himself small for us. This is how he reigns. He does not come with power and outward splendor. He does not want to overwhelm us with his strength. He takes away our fear of his greatness. He asks for our love: so he makes himself a child. He wants nothing other from us than our love, through which we spontaneously learn to enter into his feelings, his thoughts and his will. We learn to live with him and to practice with him that humility of renunciation that belongs to the very essence of love. 914 St. John St. • Lafayette, La. A Prayer for the Hurricane Season written by the second Bishop of the Diocese of Lafayette, La., Bishop Maurice Schexnayder is found below. O God, Master of this passing world, hear the humble voices of your children. The sea of Galilee obeyed your order and returned to its former quietude; You are still the Master of land and sea. We live in the shadow of danger over which we have no control; the Gulf, like a provoked and angry giant, can awake from its seeming lethargy, overstep its conventional boundaries, invade our land and spread chaos and disaster. During this hurricane season we turn to You, O loving Father. Spare us from past tragedies whose memories are still so vivid and whose wound seem to refuse to heal with passing time. O Virgin Mary, Star of the Sea, Our Beloved Mother, we ask you to plead with your Son in our behalf, so that spared from the calamities common to this area and animated with a true spirit of gratitude, we will walk in the footsteps of your Divine Son to reach the heavenly Jerusalem where a stormless eternity awaits us. Amen. The Archdiocese of New Orleans, parent of our Diocese of Lafayette, Louisiana, has released software that runs on the iPhone to keep parishioners up to date on all things Catholic. The software is called iFaith. It has a news section with text news releases and mass schedules. It has a podcast section where the audio of each of the Archbishop Hughes' homilies are available each week. And it has a video section where the weekly talk show produced by the Archdiocese is available for watching. Really amazing changes are happening. Click here to read more about it on the Archdiocese's website. 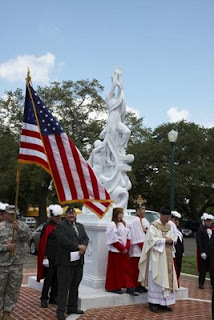 Veterans of Foreign Wars Post 2483 and American Legion Post 45 are sponsoring a Memorial Day Celebration at St. Landry Catholic Church’s 10:00 am Mass on 24 May 2009. A brief ceremony will be held after Mass in front of the Fr. LaFleur Monument. Almighty God, In whom we live, love, and have our being. Those for whom Memorial Day is more than a mere diversion. And non-violent solutions to world conflict. Bodies, or minds sickened by the sight and sounds of war. With a distant family member, friend, or loved one. Jesus is taken up to heaven. Christ is seated at God’s right hand. After the Ascension the disciples go and preach everywhere. 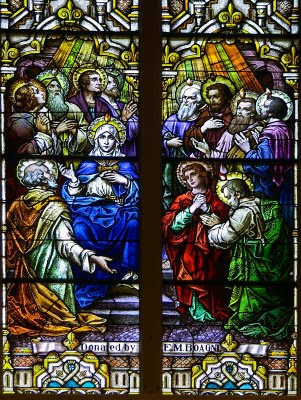 When we hear the account of the Lord’s ascension, we can only imagine how abandoned the apostles must have felt when Jesus was lifted up before their eyes. The power emanating from his passion, death, and resurrection, however, was enough to keep their hearts filled with hope and this hope was the springboard from which they began a preaching and teaching ministry that began to spread the good News of salvation, a ministry that reaches us even to this day. As today’s word is proclaimed; let us listen for words of hope, encouragement, and commissioning. Jesus helps us be brave when we need to be. When do you need to be brave? Even after Jesus ascended into heaven, he worked through the disciples to spread the Gospel. We are Jesus’ disciples today. How can you open yourself up more to let Jesus work through you to be Good News in the world today? How do you experience the divine power of Christ-among-us in your daily life? The Holy Father has released a statement and a brand new website for the 43rd World Day of Communications. 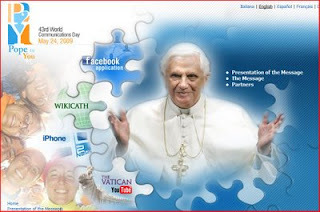 He has called on everyone --- the youth especially --- to participate in the "evangelization of this 'digital continent'". There, you'll find press releases related to the event. You'll find links to the Vatican Youtube channel where you'll find videos and news from the Vatican and of the Holy Father. There is a Facebook application on the website. And, in a few days, an iPhone app will be available as well. When we find ourselves drawn towards other people, when we want to know more about them and make ourselves known to them, we are responding to God’s call - a call that is imprinted in our nature as beings created in the image and likeness of God, the God of communication and communion. 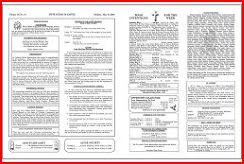 Bulletin for the Weekend of May 24, 2009 has been posted. The bulletin for the weekend of May 24, 2009 has been posted. Click here to see it. Congratulations to 7th grader Chloe Letulle who qualified to take the ACT exam through the Duke University Talent Identification, scored in the top 10 percent, and has been invited to be recognized nationally at the Grand Ceremony in North Carolina. Family and friends are reminded to please send in the General Mills box tops and Community Coffee UPC labels before the school year ends and to continue collecting all labels through the summer. 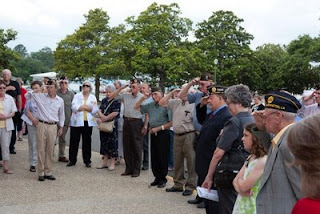 Veterans of Foreign Wars Post 2483 and American Legion Post 45 are sponsoring a Memorial Day Celebration at St. Landry Catholic Church’s 10:00 am Mass on 24 May 2009. A brief ceremony will be held after Mass in front of the Fr. LaFleur Monument. The human being needs unconditional love. He needs the certainty which makes him say: “neither death, nor life, nor angels, nor principalities, nor things present, nor things to come, nor powers, nor height, nor depth, nor anything else in all creation, will be able to separate us from the love of God in Christ Jesus our Lord” (Rom 8:38-39). If this absolute love exists, with its absolute certainty, then—only then—is man redeemed”, whatever should happen to him in his particular circumstances. Registration for the Summer Semester at Aquinas Institute closes at 12 Noon Friday, May 22, 2009. For registration information call the Office of Christian Formation at (337) 261-5674. Cost: $225 for course credit, $50 for audit. St. Landry Catholic Church Parish's own Larry Jagneaux is one of the instructors for the Theological Latin course. For more information on the Aquinas Institute, please click here. 421 ½ Carmel Avenue, Lafayette, LA. This course will provide an introduction to Latin grammar, syntax and vocabulary. The course will focus predominantly on Ecclesiastical Latin. Emphasis will be placed on developing the basic skills for reading and translating Latin. Readings and translations from the Vulgate edition of Sacred Scripture, the Roman Liturgy, and the Summa Theologica of St. Thomas Aquinas will be used. 1408 Carmel Ave., Lafayette, La. This course presents a study of fundamental Catholic moral teaching. Based on natural law and the teachings of Scripture and the Church, the course outlines a moral theology focused on the Sermon on the Mount and the virtues while addressing contemporary issues in moral thought. 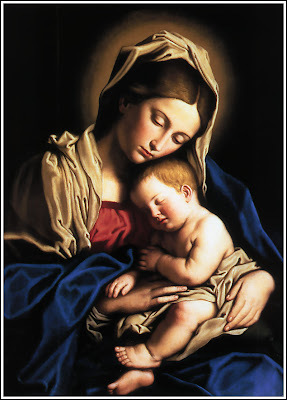 It has been said that "Mariology meets at the crossroads of Theology," and since many fundamental theological questions impinge upon the study of Mariology, this course will study the Mother of Jesus in the Mystery of Salvation, in the light of Vatican II theology from Christocentric, Ecclesiotypical, Trinitarian, and Ecumenical dimensions. Further, this course, of necessity, will be scripturally based, grounded in tradition, supported by doctrine (dogma) and nourished by Marian devotion. 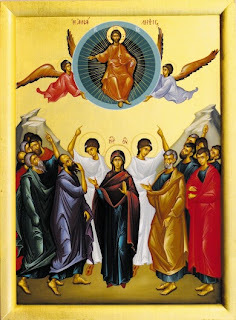 The Novena begins on the day after the Solemnity of the Ascension, Friday of the 6th Week of Easter, even if the Solemnity of the Ascension is transferred to the 7th Sunday. Don't forget: the Catholic Daughters will pray the rosary at the grotto on the south east side of St. Landry Catholic Church TODAY. Start time is 5:30 PM and the weather should be cool and beautiful. Bring a lawn chair, a family member, and your prayer intentions. There is only one Monday left in May after today. This past Lent, Father Mark Thibodeaux, S.J. conducted a Parish Mission on the topics of “Cloister, Community, and Hospitality.” As a way for us to keep the mission’s message alive in our hearts, the handout for each session will be posted here on the blog. Today, “Five Rules for a Loving Fight” follows. In the week of the 24th of May, “Session III: Hospitality” will be posted. Parishioners are encouraged to leisurely reflect on these handouts. Let the content inspire us to grow in the Lord Jesus. What drew me closest to my brothers was the delight of chatting and laughing together; of showing our affection for one another by kindly services; of reading together from books that spoke of pleasant things; … of joking together amicably; of disputing now and then but without resentment, as one is wont to do with himself; of awakening by rare contest the pleasure of being one in mind; of mutually instructing one another; of longing for the absent one, and tasting joy at his return. We loved each other with all our hearts, and these marks of our friendship that were shown in our faces, by our voices, in our eyes and a thousand other ways were among us like ardent flames that fused our souls together, and of many made but one. Nothing is more practical than finding God --- that is --- than falling in love in a quite absolute and final way. What you are in love with, what seizes your imagination will affect everything. It will decide what will get you out of bed in the morning, what you do with your evenings, how you spend your weekends, what you read, who you know, what breaks your heart, and what amazes you with joy and gratitude. Fall in love and stay in love and it will decide everything. Chose one of the quotes above and read over it prayerfully, asking the Lord to speak to you through the words. If you find a word or phrase that strikes you, stay with it and repeat it several times, allowing it to sink deep in your heart. Reflect on the reality that you are called to be with each member of your family/community. Feel the Lord calling you to them now. Which of these am I really good at? Which do I need to work on, especially in the season of Lent? Talk to Jesus about it. 1. Love can be your only motivation and the only standard by which you say one thing and refrain from saying another. Beware of “It’s a matter of principle.” When lovingly confronting, use no jokes, gossip, cynicism or sarcasm. 2. The one who initiates the confrontation must be willing to listen twice as much as he or she speaks. 3. Tell facts about others and emotions about yourself. Do not make judgments about what the other person is thinking or feeling. Simply state the observable behavior and then state how that behavior makes you feel. 5. Affirm all affirmable things. Do some affirming activity shortly after the confrontation is over. I spent a little time this morning updating the website with prayers and prayer cards related to Father Verbis Lafleur. Here is a sample of one of the prayers. You never tire of sending us examples of Your Love. You called Your servant Father Verbis Lafleur to the Priesthood from an early age and kept him in Your sight. In the fulfillment of time, he willingly offered up his life for his God and his country. Far from home on the battle fields of the South Pacific, O Lord, You were with him. You were with him in the prison camps. You were there, as he healed the spiritual wounds and comforted his comrades. Today, the Advocate newspaper has a wonderful article on Lt. Father Verbis Lafleur and his impact on the lives of the Lowe family in Riverside, California. Click here for information about the monument. Click here for the St. Landry Catholic Church photo gallery where we have photos of the erection of the monument. And click here for a 3D interactive view of the monument. The Holy Spirit is poured out on the Gentiles. In today’s first reading, Saint Peter addresses the deep division that existed between the circumcised believers and the Gentiles, the uncircumcised, who had received the outpouring of the Holy Spirit. Placing Christ at the center of the dispute became the answer and, in a bold, wise, and prophetic step, Peter orders that Gentiles be baptized in the name of Jesus Christ. Today’s readings give us much to ponder as we try to understand why religious and cultural differences sometimes erupt in acts of violence and terrorism. In what ways do you experience God’s love, offered to you through family, friends, and teachers? Jesus commanded us to love one another. Who is most in need of your love and kindness right now? Concretely, how do you show love to others? Thursday at 10 AM, Opelousas Catholic School celebrated the beginning of a new campus revitalization project. Students, teachers, and various people from throughout our community attended. The weather was beautiful and the program well organized thanks to the Mistress of Ceremonies Mrs. Kathy Hebert and the entire group there at OC. Alumni Judge Kenneth Boagni, Jr. and Deacon Jerome Collins both gave motivational talks. Louie LaBruyere, a fifth grade student, gave a message of thanks. Ron Bezet and Susan Lafleur, Long Range Planning Co-Chairs, spoke. Principal Perry Fontenot was a festive host in an OC purple blazer. And we enjoyed beautiful music from Adrion Guidry, Richard Tatman & Marla Faust, from Our Lady Queen of Angels Youth Music Ministry. Monsignor Romero and Monsignor Melancon opened and closed the gathering with beautiful prayers. Father Cremaldi and Father Bienvenu attended. Fittingly considering the history of OC, a few nuns also attended. Future generations of children will receive the benefits of a Catholic education within the soon to be revitalized classrooms. And this is a wonderful thing. Click here for photos of the event on the St. Landry Catholic Church Photo Gallery. Opelousas Catholic School thanks everyone who has supported this tremendous project for the benefit of Catholic education in Opelousas. To our OCS parents, grandparents, alumni (OCS, AIC , Holy Ghost), family and friends in the community, may God bless you! we proudly hail our varsity. OC honor to the end. The bulletin for the weekend of May 17, 2009 has been posted. Click here to see it. Opelousas Catholic School is happy to announce its official “Groundbreaking Ceremony” on Thursday at 10:00 am on the campus to celebrate the beginning of the school’s revitalization made possible by the 150th Anniversary Capital Campaign. Other important events taking place this week include the Athletic Awards Banquet on Monday at 6:00 pm; Senior Awards Banquet on Wednesday at 7:00 pm; and Graduation Mass on Friday at 7:00 pm in St. Landry Church celebrated by Bishop Michael Jarrell. Consider a gift to the Angel Appeal Drive in honor (or in memory) of your mother! According to a decree made public today and signed by Cardinal James Francis Stafford and Bishop Gianfranco Girotti, O.F.M. Conv., respectively penitentiary major and regent of the Apostolic Penitentiary, Benedict XVI will grant priests and faithful Plenary Indulgence for the occasion of the Year for Priests, which is due to run from 19 June 2009 to 19 June 2010 and has been called in honour of St. Jean Marie Vianney. The Parish Council nominating committee came up with four candidates for election to fill three positions. However, one other member of the Pastoral Council has chosen to step down. This means that the four nominated are appointed without election. These new members are Mr. Dwayne Joubert, Mr. Richard LaFleur, Mr. Kenny Moreau, and Mrs. Cindy Prather. For a list of Parish Council members and contact information, please click here. Information about the new members is listed below. I am completing my first 3 year term, having served as council chair for the past 2 years. My wife, Mary, and I are deeply rooted in St. Landry Catholic Church, and since returning to Opelousas some five years ago, we have carried on this tradition with our daughter, Sarah. In addition to serving on the Council, I am a lector at Mass, serve as coordinator for the Altar Servers and am a member of the Knights of Columbus #1048 serving as Exalted Ruler/President. I am also in my second year of Permanent Diaconate Formation. I appreciate all the prayers and support I have received over the past several years. My husband, Burton Prather, and I have been married for 17 years. We have two beautiful children, Brooke and James, who are a junior and a freshman at Teurlings Catholic, respectively. I also have the privilege of serving God as Principal of St. Ignatius Catholic School. I have been a member of St. Landry Catholic Church for 19 years and currently serve as a lector and Eucharistic minister. This church parish has had a big impact on my life, as I attended RCIA classes here to become a Catholic. Burton and I were married in this church, baptized both children and they received their First Communion here as well. Brook will be confirmed here later this month. To serve on the Parish Council is an honor and an opportunity for me to give back to my church community. My wife, Carrol, and I have been married for 39 years. We have 4 children and 6 grandchildren. As a youth, I was an altar server at Our Lady of Mercy Church and I graduated from the Academy of the Immaculate Conception. I have been a parishioner of St. Landry Church since 2005 with involvement in the Father Verbis LaFleur monument project and the cemetery tours. Since the age of 6, I have been a parishioner of St. Landry Catholic Church. My wife Dolores Lagrange Moreau, and I reared 3 daughters and 1 son. Our children attended Opelousas Catholic and we are now the proud grandparents of two grandchildren. After 35 years with the Opelousas Fire Department, I recently retired with the rank of Assistant Fire Chief. In addition to my career with the fire department, I have been a member of Hope Hook & Ladder Volunteer Fire Department for 39 years and served on the Louisiana State Fireman's Association Board from 1999 to 2007. Moreover, since 1979, I have been a member of the Opelousas Elks Lodge serving currently as the Exalted Ruler. to the soul that seeks him” (Lam 3:25)!" Graduation and mass for Opelousas Catholic School is Friday, May 15, at 7 PM with Bishop Michael Jarrell as the celebrant. St. Landry Church Parishioners offer words of congratulation to all graduates – High school and College and University. While many times we focus on graduations as completion of study, let us see it as a commencement of activity. It begins a new aspect of life. It may be more school; it may be military service; it may be professional work. Graduation is the time to look ahead, seeing what we can do for society and for God. May God bless each and everyone with a sense of purpose and a strong desire to do God’s will. Dear Jesus, you have blessed me with many gifts. The gift of an education provides me the skills to be a better person and to advance toward a career and a vocation. Please help me do my best to always bring your values to my life’s activity. Please help me work for a better world, where you are the focus of life and work. Amen. 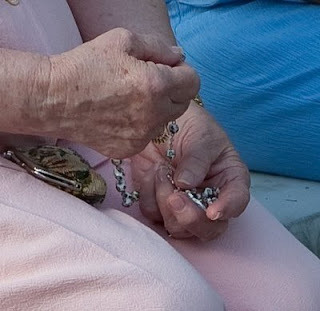 Today, Monday, May 11th at 5:30PM join the Catholic Daughters and pray the rosary. May is the Month of Mary. Come and bring a friend as well as your prayer intentions. 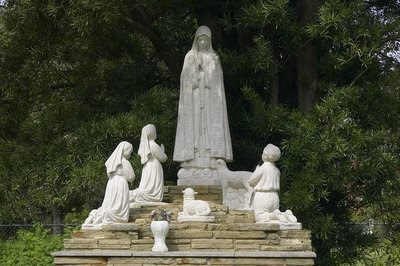 We'll meet at the Grotto on the south east side of St. Landry Catholic Church. Bring a lawn chair. This past Lent, Father Mark Thibodeaux, S.J. conducted a Parish Mission on the topics of “Cloister, Community, and Hospitality.” As a way for us to keep the mission’s message alive in our hearts, the handout for each session will be posted here on the blog. Today, “How to Have Daily Cloister Time with Jesus” follows. Next week, “Session II: Community” will be posted. In the week of the 24th of May, “Session III: Hospitality” will be posted. Parishioners are encouraged to leisurely reflect on these handouts. Let the content inspire us to grow in the Lord Jesus. Every person, every family and every community needs to have a balance of cloister, community, and hospitality. But for each, that balance will look a little different. In your own personal life, is there such a balance? Do you have as much cloister as you need? In your family/community life, is there as much cloister as is needed? What do you and your family/community need to do in order to being about such a healthy balance? Ignatius was convinced that the Creator deals directly with the creature. Do you have that direct contact with God? Ignatius saw himself as a companion of Jesus. Do you have a companionship with Jesus? In our spiritual lives, sometimes we see ourselves as being called to God’s House and sometimes we hear Christ knocking on the door of our own house. Which image resonates more with your present spiritual life? Speak with Jesus about this. I don’t need to pray for long stretches of time every day, but I do need to pray a little every day. Very few people have the luxury of praying for long periods, and frankly it isn’t necessary. If I am a beginner, I could start with ten or fifteen minutes and very gradually build up to thirty or thirty-five. That’s all that is really necessary. What is essential is that I do not skip many days. It is better to pray consistently for fifteen minutes a day than to pray an hour only every now and then. Concretely, what do I do in my prayer time? There are many step-by-step guides for beginners in prayer including my own book Armchair Mystic. I recommend getting one of these and working through it with a mentor who has been praying a while. Basically, this is what usually happens in one’s daily prayer. Before beginning prayer, I think about what has been on my mind and heart these days, what I might want to pray about. I set by my side anything that might help me to focus on this matter: a scripture passage, a spiritual reading, a photograph, the brochure of the college I hope to attend, a journal entry, my wedding ring. I begin with some formulaic prayer such as the Lord’s Prayer or the Glory Be. I ask God to come to me and I name for God the topic about which I would like to pray. I spend a few moments getting myself quiet. I might hum a religious song for a while. I stay with this quieting down as long as it feels right. Sometimes, it’ll take up the entire prayer time. If I feel moved to do so, I pick the object I’ve placed by my side. I read the scripture passage. I look intently at the photograph. I hold my wedding ring in the palm of my hand. If I don’t have any such object, then I close my eyes and place before me an image that moves me: the person I have strong feelings for, the city I’m being transferred to, the sin I hope to be freed of. As best I can, I now let the Lord take over and let whatever happens happen. My only job is to spiritually hold that object or image, to mull it over in my mind and my heart. I avoid getting heady about it; I don’t use this time for intellectual reasoning. Instead, I simply sit with this matter: I hold it not only in my hand or my head but most especially in my heart. I allow this matter to move me to some deep emotion: joy, fear, contentment, anger, peace, longing, sorrow. I sense Jesus or God the Father present with me in this manner. I imagine the Lord being moved by this as well and I begin to sense the way in which the Lord is moved. I notice that the way my heart is feeling about the matter is moving in sync with the way the Lord is feeling about it. Or I notice the opposite: I notice how differently we seem to feel about it. I listen quietly for anything the Lord might want to say to me. I listen for anything my heart might be saying to the Lord. Father. I thank God for this moment and I close with the Sign of the Cross. My prayer life will go smoother if I have a consistent time, place, and opening and closing ritual. For example, I might pray in my overstuffed living room chair every morning before the kids wake up. I might begin every prayer with a Glory Be and end it with a Morning Offering. I might light a special candle or cover myself with a blanket or prayer shawl. It is highly recommended that I work with a mentor or spiritual director who has been praying this way for a while. I will need someone to speak to about my prayer as questions or problems arise. The Catholic Daughters of America will meet this week on Tuesday, May 12. The meeting starts at 6 PM with a mass at Our Lady of Mercy Catholic Church in Opelousas. Afterwards, the group will gather in the catechism center there. The meeting will include the installation of new members. Awards will be given out including a scholarship from the state organization of Catholic Daughters to local student Angelica Simmons. true happiness unto your hearts. Mary is Mother of the Savior. Just as obviously, however, we can and must affirm that she is our Mother because, by living her very special maternal relationship with the Son, she shared in his mission for us and for the salvation of all people. Homily for the Solemnity of Mary, Mother of God. Saul spoke out boldly in the name of the Lord. We should believe in the name of Jesus Christ and love one another. A marvelous image of the Church is set before us in today’s readings. Jesus refers to himself as the vine and calls his followers the branches. Saint Paul, who once persecuted the early Christians---in a sense, attempting to sever the branches—is converted to Christ and begins to proclaim boldly the name of the Lord. The Church is made up of a wide variety of people who together make up this glorious vine that bears the fruits of justice and peace, forgiveness and reconciliation, comfort and consolation. How do you keep yourself connected to Jesus in your daily life? Jesus is the vine and we are the branches, connected to Him as our life-source. When do you feel most connected to Jesus in your everyday life? How can you go there more often? How does your own connection to Christ, the vine, affect your daily life? What image from this reading helps you see the importance of this connection to Christ? Click here for his schedule for the week. Click here for photos of the trip. "We are not a political power but a spiritual force, and this spiritual force is something that can contribute to progress in the search for peace," the pope told reporters aboard his Alitalia charter jet May 8. As believers, he said, Christians are convinced of the power of prayer. "It opens the world to God, and we are convinced that God listens and can work in history. And I think that if millions of believers pray this is truly a force that can have an influence and advance the cause of peace," he said. The pope, standing next to aides in the reporters' section of the plane, took four questions submitted by journalists and read aloud by the Vatican spokesman, Jesuit Father Federico Lombardi. The pontiff said that in addition to prayer the church contributes to peace by forming consciences and convincing people to liberate themselves from personal or particular interests in favor of the common good. He emphasized that the church's teachings on peace and tolerance are founded on "truly reasonable positions" that are not in conflict with faith -- a point the pope has made consistently throughout his pontificate, most strongly in a speech in Regensburg, Germany, in 2006. The pope said it was a difficult time for the beleaguered Christian population in the Holy Land, but also a time of hope, of a "new beginning and new effort on the way of peace." Christian communities are an important component of the life of Middle Eastern countries, and the church wants to encourage them to have the "courage, the humility and the patience to remain in these countries," he said. For their part, he said, the Christian communities contribute to society especially through their networks of schools and hospitals. Schools in particular -- including the university the pope will lay the foundation stone for in Jordan -- help bring Christians and Muslims together, he said. "They meet here and speak to each other. It's also a place where a Christian elite is formed that is prepared precisely to work for peace," he said. Asked about Catholic-Jewish relations, the pope said it was important that both faiths shared books of the Old Testament and thus have "common roots." "Naturally, after 2,000 years of distinct, in fact separate, histories, it's not surprising that there are misunderstandings, because different traditions of interpretation, language and thought have formed," he said. Today, he said, it was important for Christians and Jews to make great progress in learning each other's language again. In part, this is being done through university exchange programs, he said. "We are learning from each other, and I am certain and convinced that we are making progress. This will also help the cause of peace, and in fact of mutual love," he said. 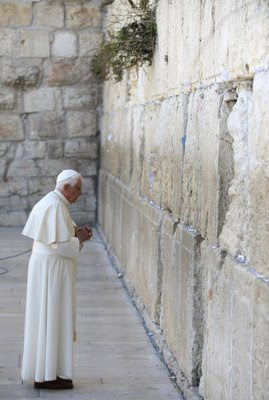 The pope said "trilateral" dialogue among Christians, Muslims and Jews was also important, and is helped by the fact that all three faiths have a common belief in one God and a common descent from Abraham. 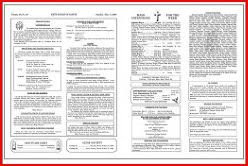 The bulletin for the weekend of May 10, 2009 has been posted. Click here to see it. 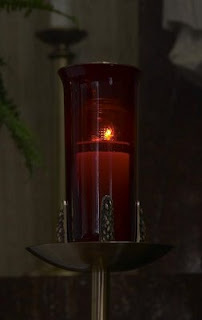 The parish web site has been updated with a new Prayers page. On it, you can read the names of everyone on our parish prayer intention list. Also listed are the prayer intentions for the sanctuary lights in the church and in the chapel. You can find it from the front page by clicking the word Prayers on the menu bar near the top. Today, the nation celebrates the 58th Annual National Day of Prayer. Many ecumenical groups are gathering together in public places across our country. Click here for the website for the National Day of Prayer Taskforce. For a wonderful story about the Franciscan Sisters of Perpetual Adoration for whom every day is a prayer day, please click here. Jesus, the Good Shepherd, acts in souls with his grace. “My grace is sufficient for you” (2 Cor 12:9), the Apostle Paul heard the Lord answer when he asked the Lord to spare him suffering. May this very awareness always nourish your faith and stimulate within you the search for ways to reach the hearts of all with the healthy optimism that you must always spread around you. I take this occasion to thank Mr. Bobby Dupre for the refreshed parking lot at Valentin Hall. He donated the limestone. It is a much-needed improvement. Many thanks. 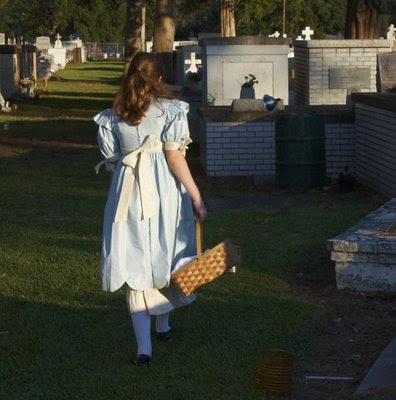 The next meeting of the Cemetery Tours group is scheduled on Monday, June 8 at 5:30 PM in Valentin Hall. Please make plans to attend this meeting as we continue our plans for the next season. We had a small group for our rosary this afternoon. The weather was beautiful and we had a nice, prayerful time. Mark your calendars for the next rosary on May 11th at 5:30PM. May is the Month of Mary. Come and bring a friend as well as your prayer intentions. May is the Month of Mary. 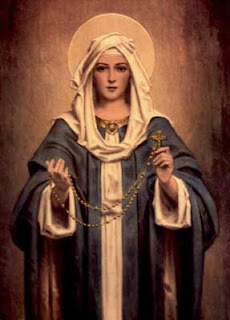 All parishioners are invited to pray the rosary every Monday evening in May at 5:30 pm in honor of our Blessed Mother --- starting today, May 3. 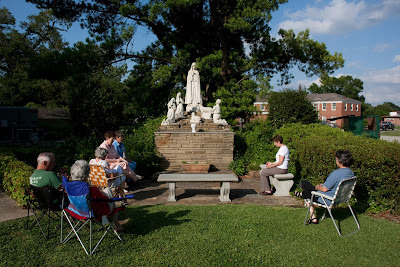 The Catholic Daughters will gather at the grotto behind St. Landry Church for the rosary. Everyone is welcome to come; bring your own intentions and join them in praying the rosary. Don’t forget your lawn chairs! On the occasion of the next World Day of prayer for vocations to the priesthood and to the consecrated life, which will be celebrated on 3 May 2009, the Fourth Sunday of Easter, I want to invite all the People of God to reflect on the theme: Faith in the divine initiative - the human response. The exhortation of Jesus to his disciples: “Pray therefore the Lord of the harvest to send out labourers into his harvest” (Mt 9:38) has a constant resonance in the Church. Pray! The urgent call of the Lord stresses that prayer for vocations should be continuous and trusting. The Christian community can only really “have ever greater faith and hope in God's providence” (Sacramentum Caritatis, 26) if it is enlivened by prayer. Who can consider himself worthy to approach the priestly ministry? Who can embrace the consecrated life relying only on his or her own human powers? Once again, it is useful to reiterate that the response of men and women to the divine call, whenever they are aware that it is God who takes the initiative and brings His plan of salvation to fulfilment, is never patterned after the timid self-interest of the worthless servant who, out of fear, hid the talent entrusted to him in the ground (cf. Mt 25:14-30), but rather expresses itself in a ready adherence to the Lord’s invitation, as in the case of Peter who, trusting in the Lord’ word, did not hesitate to let down the net once more even after having toiled all night and catching nothing (cf. Lk 5:5). Without in any sense renouncing personal responsibility, the free human response to God thus becomes “co-responsibility”, responsibility in and with Christ, through the action of his Holy Spirit; it becomes communion with the One who makes it possible for us to bear much fruit (cf. Jn 15:5).